I went to Hiroshima today, which was the most serious and emotionally intense leg of my trip so far. 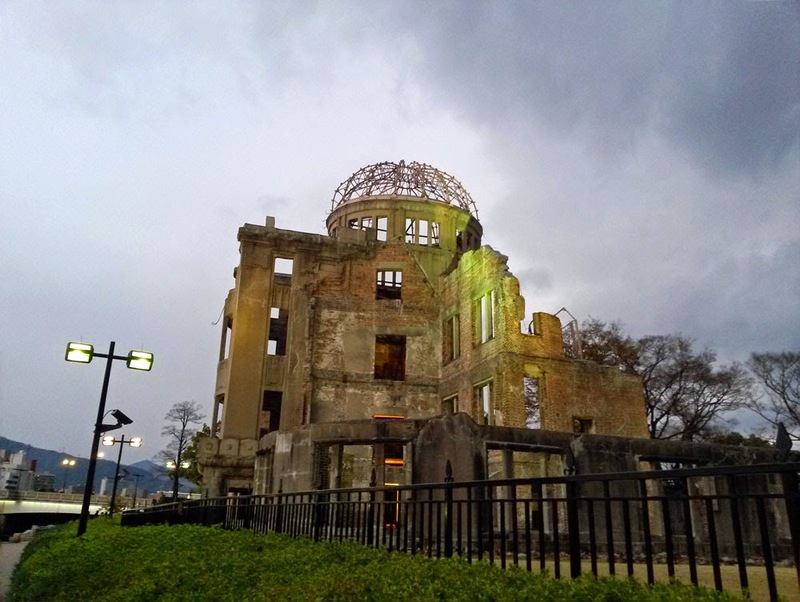 After arriving in Hiroshima station I went to see the Bomb Dome first. It was at 8:15am, on August 16th, 1945, when the atomic bomb detonated approximately 600 meters above and 160 meters south east of the building and killed 66,000 people instantly and critically wounded another 69,000. 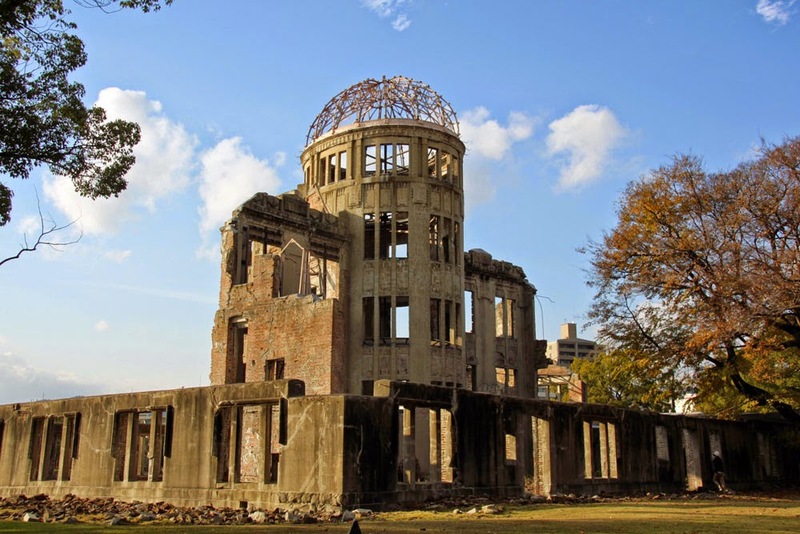 The A-Bomb Dome is the only ruin that was preserved in the destruction of Hiroshima, making it a national landmark and a memorial to all of those lives lost in the explosion. After that, I entered the A-bomb Memorial Museum. The exhibits were all about the history of Hiroshima, Japan's involvement in the world war 2 and the specific effects of the bomb. It was an intense museum to walk through, especially because it not only featured before and after photos and models of the blast, but it has exhibits featuring recovered belongings of specific people who were killed. The whole visit was chilling. When the bomb detonated, it left Hiroshima in ashes, contaminated completely by radiation and unable to support plant life for a long time. The stories told about people's deaths were deeply upsetting, as a great many of them were children caught in the blast on their way to a school that was right in the major centre of the blast area. Out of all the things I experienced in my trip to Japan so far, this stop was the most humbling. On my way out of the museum I stopped by the Children’s Peace Monument. It shows Sadako Sasaki- the post-atomic bomb Japanese icon of hope. Sadako was two years old when the atomic bomb was dropped on Hiroshima. She was two kilometers away from where the bomb exploded. Most of Sadako's neighbors died, but Sadako wasn't injured at all (at least not in any way people could see). However, when eleven years old Sadako found out that she had leukemia (at that time called the A-Bomb disease). In Hospital a friend told her about a legend, that if a sick person folds 1,000 paper cranes, then that person would soon get well. After hearing this Sadako decided to fold 1,000 cranes in the hope that she would get well soon. She kept folding cranes even though she was in great pain. She always tried to be cheerful and hopeful. However, she was not able to fight the cancer and died. By then she had folded a total of 644 paper cranes. 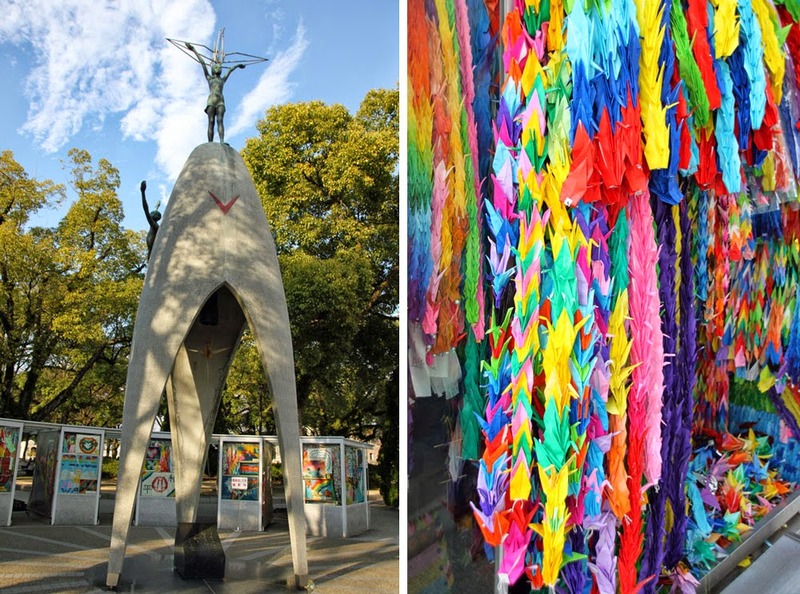 Children from all over the world still send folded paper cranes to be placed beneath Sadako’s statue (right picture above). After the years of struggle after the atomic bomb, Hiroshima clearly has successfully rebuilt itself. The city looks so peaceful, you wouldn’t even expect that something so intense hit them at one point in history. PS: This post was written on Dec, 4th.